The preface to the book which the authors open with a lamentation over a state of affairs of American math education, in general, and a small number of young Americans choosing math as a vocation, in particular, filled me with apprehension. Have the authors really thought that a book might change the attitude of a generation towards mathematics. Even, a more modest goal of writing a book that could stir up interest in the subject might have proven a tall order. Yes, it might. It might also have been a bad day for me to browse a book for review, but, whatever the reason, and even though I own and love Arthur Benjamin's other books, on that first encounter with the book, I set out to find out its faults. While the main purpose of the book is to illustrate how interesting and intriguing (and sometimes mysterious) just one area of mathematics can be, this book can also be used as a textbook. Indeed it can: there are theorems and proofs, many solved or proved examples, index, and exercises, although the latter have been unusually placed at the end of the book. Unlike most other modern textbooks, this one has no boxed inserts or special sections. Instead it appears as if the authors set out to tell a story - a story about graph theory, about people who played a role in its development, the circumstances under which it happened, the reasons and the meanings of its elements. The book is written masterfully; the narrative in each chapter flows naturally, engagingly; theorems and proofs may require more focused attention but, otherwise, harmoniously arise within the narrative. The book is certainly unusual: it's a popular but also comprehensive introduction into graph theory; it broadly covers applications of the theory, puzzling and serious (e.g., the Instant Insanity puzzle vs the Traveling Salesman Problem); it is so well written I could classify it as a literary event. The book will be enjoyed by curious high school students; it will be found useful, besides being a very good read, by any one interested in discrete mathematics - its results, history and evolution. 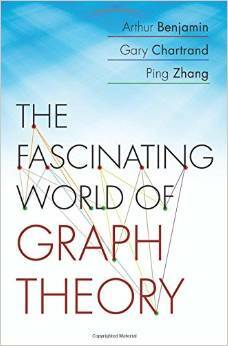 The Fascinating World of Graph Theory, Princeton University Press (January 18, 2015). Hardcover, 344 pp, $29.95. ISBN 0691163812.